Jean K Abbott, age 93, of Knoxville passed away Tuesday morning, November 13, 2018 surrounded by her family. She was the former owner of Taco Rancho. 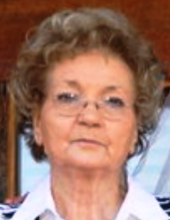 Jean is preceded in death by her husband, Allen Abbott; granddaughter, Amanda Abbott. She is survived by her children, Diana West, Jerry Abbott and wife Charla, Steve Abbott, Larry Abbott and wife Teresa; grandchildren, David Abbott, Michael Abbott, ShawnNa Kettleman, Jennifer Gray; great grandchildren, Justin, Derek, Taylor, John, Ashley, Madyson, Delayshia, Kaden and Charleigh; great great granddaughter, Madi Mae; several nieces and nephews. Click Funeral Home, 9020 Middlebrook Pike is serving the Abbott family. To send flowers or a remembrance gift to the family of Jean K. Abbott, please visit our Tribute Store. "Email Address" would like to share the life celebration of Jean K. Abbott. Click on the "link" to go to share a favorite memory or leave a condolence message for the family.